SPECIAL OFFER! 20% off, only £25.07! 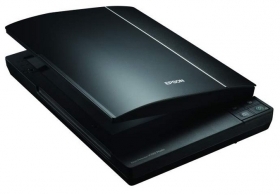 Get superior-quality, A4 photo scanning with the Epson Perfection V370 Photo, which features a built-in transparency unit for easy scanning of slides, film and negatives. Thanks to the scanner's high optical resolution of 4,800dpi and CCD (charged-coupled device) technology, you can be confident that every detail will be faithfully captured with exceptional clarity.